This coffee drink uses real coffee rather than a coffee liqueur. The coffee presence is strong and even the caffeine effect is noticeable. American brandy (or non-cognac brandy) and kirschwasser give it alcoholic oomph. The lemon twist is a nice touch, like the twist with espresso coffee. It brightens the scent of what tastes like a roasted bean bitterness and cherry sweetness. Califia Cold Brew coffee is a great addition to this drink. Cold brew coffee is brewed longer with cold water. The process extracts a lot more flavor, so the coffee notes are intense when used in a drink. 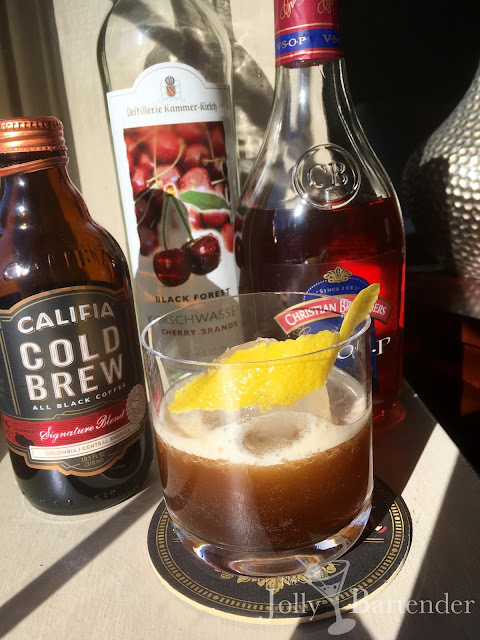 There's less of a sense that coffee dilutes the cocktail when cold brew is used. Combine liquid ingredients in a shaker with ice. Shake and pour into a chilled Old Fashioned glass. Garnish with the twist.